N.C. Politicos Pan Proposed Rev. Wright, Anti-Obama Ad Idea : It's All Politics We decided to check in with political types in North Carolina, where the electorate is about 72 percent white and 23 percent black, and where polls show Obama and expected GOP nominee Mitt Romney in a dead heat. We asked how ads featuring the incendiary Rev. Jeremiah Wright would play in their state. The Rev. Jeremiah Wright addresses the National Press Club in Washington in 2008. Battleground states like North Carolina are where the action is when it comes to presidential contests. Thus, they are where political tactics like, say, the anti-Obama ad campaign featuring the Rev. 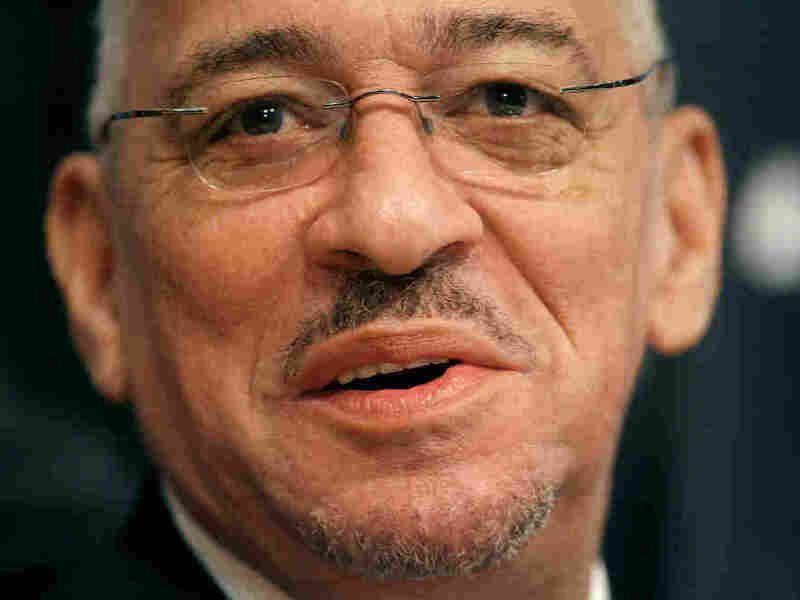 Jeremiah Wright, first reported by The New York Times Thursday (and now disowned by virtually everyone the Times linked to it), are most likely to be rolled out. My colleague Liz Halloran talked with some politicos in the Tarheel State to hear what they thought of the proposed anti-Obama campaign. They included Democrat Gary Pearce who was an adviser to former Gov. Jim Hunt and Carter Wrenn, the man behind one of the most infamous Republican campaign ads in recent political history. His 1984 ad for the late longtime senator, Jesse Helms, showed a pair of white hands crumpling a job rejection letter as the narrator blamed minority hiring. The political world was aflutter (atwitter?) Thursday over a report in The New York Times that strategists affiliated with a Republican superPAC planned to resurrect as a campaign issue President Obama's past affiliation with the Rev. Jeremiah Wright. The Times provided a view of the racially tinged advertising campaign proposal, and said the strategists planned to launch the broadside during September's Democratic National Convention in North Carolina. We decided to check in with political types in North Carolina, where the electorate is about 72 percent white and 23 percent black, and where polls show Obama and expected GOP nominee Mitt Romney in a dead heat. We wanted to get their thoughts on how ads featuring the incendiary Wright, the president's former pastor, would play in their key state. Would reviving 2008 efforts to portray Obama as embracing the reverend's black liberation theology be a winning strategy to define the president? "The electorate isn't going to throw out a guy who reportedly has had personal positives on simply a whim, or someone's racist-tinged campaign. As a black woman who did not vote for Obama the first time and won't vote for him this go round, I think that the way to attack him is on the questionable values he does not share with the majority of voters. ... He is so deep into businesses' pockets, the gay community and everyone but the American people. If strategists do [what has been reported], they will rip the nation further apart and we all lose. Romney is the right choice, for he has kept his attacks on policies and not the person." "I just don't think there's any room for this at all. It's ill-advised to come in and play on such divisive issues as Jeremiah Wright — that's past history. People here are concerned about jobs, their checkbooks. It's wedge politics and clearly something that as a state we need to get away from. They just can't seem to help themselves in playing the race card." "It's sort of old news. I guess it would depend on whether they have a legitimate point that they're trying to make. But that got vetted pretty thoroughly four years ago. Maybe it doesn't have much impact. If they've got a point about Wright that has people say, 'I hadn't thought about that,' that might have some impact. If it's perceived as a racial attack, it could backfire. "If it's a rehash, it doesn't do anything. If it turns into a gratuitous slam, it may backfire. The swing voters are mostly concerned about economic issues. They are focused on jobs." "It certainly would play with a very conservative segment of the Republican base. But our swing voters are moderates in the Raleigh and Charlotte suburbs. A racially tinged appeal is going to turn those voters away from the Republican Party. This is very much like a 1984 North Carolina strategy. It has the potential to antagonize our center. [Nationally] this election is going to be decided by moderate voters in the suburbs. The more race is an issue, the better off Obama's going to be. We don't have many racist swing voters." "Clearly, both sides are going to try to define the other side. Both sides are already starting with very aggressive media buys across the country. The message matters. The message I'm hearing that's resonating with unaffiliated voters is that the economy is bad and the president's job performance is questionable. Defining candidates can be perceived as negative depending on who's watching, and comparing or contrasting candidates goes back to the beginning of time." "Race? We're pretty familiar with that kind of politics in North Carolina. I suspect that everybody who is going to vote against Obama because he's African-American has already figured that out. Going to the lowest level of politics to win will hurt Romney. Say Romney repudiates it and the ads still run — somebody ought to call BS. That's the way the system is, thanks to the U.S. Supreme Court. These are your friends, your supporters, and if you can benefit, you should also get hurt by it. You play with fire, you can get burned. This crowd is playing with the most volatile, explosive issue in American politics."